Roger Federer, still dealing with illness (flu bug) which caused him to miss two days of practice over the weekend, was forced to work hard in coming back from a one set deficit to defeat the big serving Canadian, Milos Raonic. Nicknamed “the missile,” Raonic won 96% of first serve points in the first set to edge the Swiss maestro 7-6 (4). Federer was unable to read serve the entire set, but quickly put balls back into play and broke in the opening game of the second set. He cruised for the time being, breaking Raonic twice to win the set 6-2. The young Canadian did not fade away, however, as he and Federer battled it out to 3 all 30 all in the third and deciding set. It was at that moment where Federer broke for 5-3, and eventually held serve to close out the match. The Swiss maestro has now won his last 73 matches against opponents outside the top 20, since his last loss in the 2010 Halle final to Lleyton Hewitt. Federer has now won 11 consecutive matches and 35 of his last 37 matches. Afterward, Federer had much praise for Raonic. “I was impressed (by Raonic),” triple champion Federer said. “He played great and made it hard for me by winning that first set tiebreaker. In a quick turnaround, Federer will face Thomaz Bellucci in the 4th round, last in Wednesday’s day session. 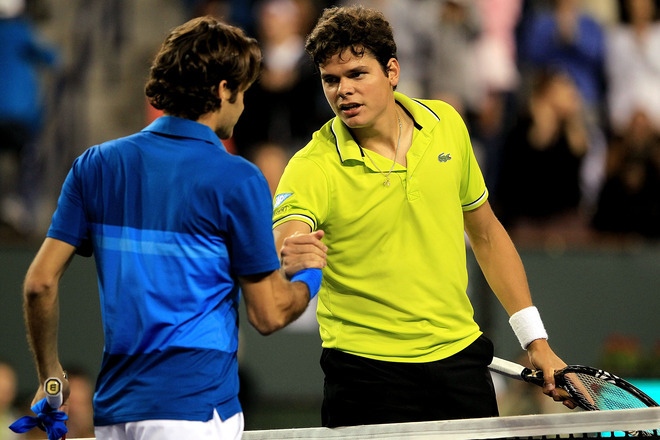 Watch the match and the rest of the action at the BNP Paribas Open (Indian Wells) on FF07tv.